Two months ago I blogged about the Energizer Ultimate Photo Contest, which was open to anyone, and with a fabulous Grand Prize of a trip to the Greek Isles plus a feature in an Energizer ad in December's issue of National Geographic. Twelve finalists have been chosen, and Energizer is encouraging everyone to check out their photos at www.nationalgeographic.com/lithium and vote for their favorites! Votes will be accepted through September 15 -- all you have to do is click on the "Choose" button below your favorite photos. No registration required, it couldn't be easier. The only difficult part will be deciding which photos you like best! Twelve photographers from across the country have just been named Category Finalists in the 2010 Energizer Ultimate Photo Contest with National Geographic. They are now one step closer to their “shot” at greatness—the Grand Prize Winner will receive a trip of a lifetime to the Greek Isles and will see his or her photo appear in the pages of National Geographic magazine in an ad for Energizer® Ultimate Lithium batteries. The 2010 Energizer Ultimate Photo Contest, which launched in April, has named two Finalists in each of its six thematic categories: animals/wildlife, nature, travel, people/cultures, weather and action/energy. Now it’s up to the public to pick the Category Winners. From now through Sept. 15, people can go to www.nationalgeographic.com/lithium to view the gallery of Category Finalist photos and to select their favorite in each category. From more than 14,000 entries, 12 photos stood out as the best in their respective categories, according to Jim Richardson, National Geographic photographer and judge for the Energizer Ultimate Photo Contest. The Finalist who receives the most votes in his or her category will advance to becoming a Category Winner. The six Category Winners will enter a second round of judging by Richardson, who will determine the Grand Prize Winner, to be announced on or about Nov. 4, 2010. You may not have been one of those lucky twelve finalists, but you can still be a winner with Energizer. They have offered me an Energizer Gift Pack to give away on my blog! One lucky Bonggamom Finds reader will win two four-packs of Energizer® Ultimate Lithium AA batteries and two four-packs of Energizer® Ultimate Lithium AAA batteries. Go to www.nationalgeographic.com/lithium, check out the entries to the Ultimate Photo Contest, then come back here and leave a comment telling me which 3 photos you like best. This entry must be completed before extra entries qualify. 1) Go to www.nationalgeographic.com/lithium, vote for your favorite photo in one of the categories, then come back here and leave a comment telling me which one you voted for (1 entry). This giveaway ends at 11:59PM PST on September 15, 2010; I will draw a winner at random on September 16 and post the winner's name after the winner confirms acceptance. US addresses only. For additional giveaway rules, click here. Good luck! Disclosure: I will be receiving an Energizer gift pack similar to the one being provided as a giveaway prize. I was not paid to review the product or give my opinions. Contest information is provided by the featured company and is clearly indicated as such. The views and opinions expressed here are my own. Click here to read about what my family likes to eat for breakfast -- and enter to win a $100 Visa gift card. The Pea has a voracious literary appetite, and she's constantly on the lookout for new books to read. She's the type who borrows a dozen books at a time from our local library, then goes back the next day to get more. 3Po and Jammy aren't quite there yet. At 6 and a half, they're reading now, but they don't read well enough (or aren't confident enough that they do) to seek out books to read on their own. But I remember when they were babies and I was freaking out because they didn't want to sit and look at books with me. It turns out all they needed were books that they were interested in. Once I bought a couple of board books about trucks and wheels and race cards, they couldn't get enough. I think it's going to be the same thing with independent reading -- once they find a book series that captures their attention, they're going to sit and read it because they want to find out what happens. I recently discovered a new book series that might just be one of those kinds of books that's going to help ignite my boys' passion for reading. I was recently invited to review (and give away!) Spaceheadz, book 1 in a series about a 4th grader who discovers he's got some aliens in his class. It'll probably be 6 months to a year before they can read it on their own, but already they're enjoying it. I think they might even attempt to read it by themselves sooner because they really like the story! * It's an easy read, which means that reluctant or insecure readers won't be too stressed out about finishing it. And the abundant illustrations and variety of fonts make it almost like a comic book, which means that even kids who don't think it's cool to read will have no problem opening this book in front of their friends. * It's funny and entertaining and irreverent. Jon Scieszka, the author, really has his finger on the funnybone of kids today (Jon's Trucktown series has been a favorite of 3Po and Jammy's for a while now, and his Stinky Cheese Man and Other Fairly Stupid Fairytales is just plain hilarious). Who else would devote a whole chapter to a monologue written by a hamster, in hamster language? I saw The Pea giggling to herself throughout the book, and ever since she found out that Spaceheadz Book 2 is scheduled to go out in December, she's been bugging me to reserve it. * The SPHDZ fun continues online, long after the book has been read. Kids can log on to the Anti Alien Agency to view and read more about past agency cases, including the gory details of the infamous Fried Santa Incident. They can tweet with Major Fluffy on Twitter or read his blog (just make sure you can read hamster). They can interact with Bob Spaceheadz on Facebook or watch videos on Jennifer Spaceheadz's Youtube channel. They can even check out Michael K's fourth grade class website. It's the best integration of print, internet and social media I've seen! Sometimes I feel the book is too gimmicky; at times I got quite distracted with all the SPHDZ stickers and the crazy drawings. And I couldn't figure out how to pronounce SPHDZ (spudz? ssffdzz?) until I went online and viewed the video below. Or maybe I just need to chill out and BE SPHDZ. Spaceheadz is a Quicker Picker Upper, 100% All Natural, Powder Fresh and Out of This World. If any book is going to turn reluctant readers into bookworms, this might be it! Leave a comment on this post with your favorite TV commercial or ad slogan. This entry must be completed before extra entries qualify. 1) Become a SPHDZ, then come back here and leave a comment with your official SPHDZ name and number (3 entries). 2) Upload a photo with your SPHDZ certificate on it to the Bonggamom Finds Facebook page wall. (3 entries). 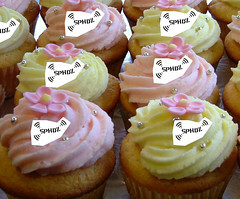 3) Upload a photo with a SPHDZ sticker on it to the Bonggamom Finds Facebook page wall. You can check out some of Bob Spaceheadz's photos or Jennifer Spaceheadz's photos (both on Flickr) for inspiration (5 entries). 4) Follow Major Fluffy on Twitter (1 entry). This giveaway ends at 11:59PM PST on September 20, 2010; I will draw 3 winners at random on September 21 and post the winner's name after the winners confirm acceptance. For additional giveaway rules, click here. Good luck! Disclosure: I received a sample book, but was not paid to review the product or give my opinions. Product information is provided by the featured company/product and is clearly indicated as such. The views and opinions expressed here are my own. You can find more ideas on the DINOSAUR TRAIN website. Dinosaur Train is a favorite with my kids; they love the cute characters and the real-life educational segments at the end of each episode. I think it's a great show for about-to-become-kindergarteners, kindergarteners, first graders, and any schoolchild who loves to learn! * Dinosaur Train 16" backpack featuring Buddy the T-rex, from Accessories 22. * Dinosaur Train: I Am a T-Rex book from Grossett & Dunlap. * Triceratops for Lunch book from Golden Books. * Dinosaur Train Take N' Play Anywhere™ Go Fishing™ magnetic activity from Patch Products. * Dinosaur Train Dinosaur Collectible 3-Pack dinosaur figures from Learning Curve. * Dinosaur Train's All Aboard game from Pressman Toy Corp.
Leave a comment on this post and share your own tip for helping your child get ready for kindergarten. This entry must be completed before extra entries qualify. Last year I participated in an Office Max back-to-school blogcast, and my co-panelist Heather told me something that totally blew my mind -- teachers spend an average of $1000 of their own money on school supplies for their classrooms! Her figure is corroborated by studies from the non-profit organization World Vision, which show that teachers spend on average at least $500 of their own money each school year on supplies for their students. This year Avery is holding the "Avery Celebrates Teachers" sweepstakes, open to all teachers (including homeschooling parents), which aims to help out some lucky teachers by awarding them prize packs worth $80, $200 and (for the Grand Prize) $1000. (For complete sweepstakes rules, click here. Sweepstakes ends on September 15, 2010). participates in Box Tops for Education? 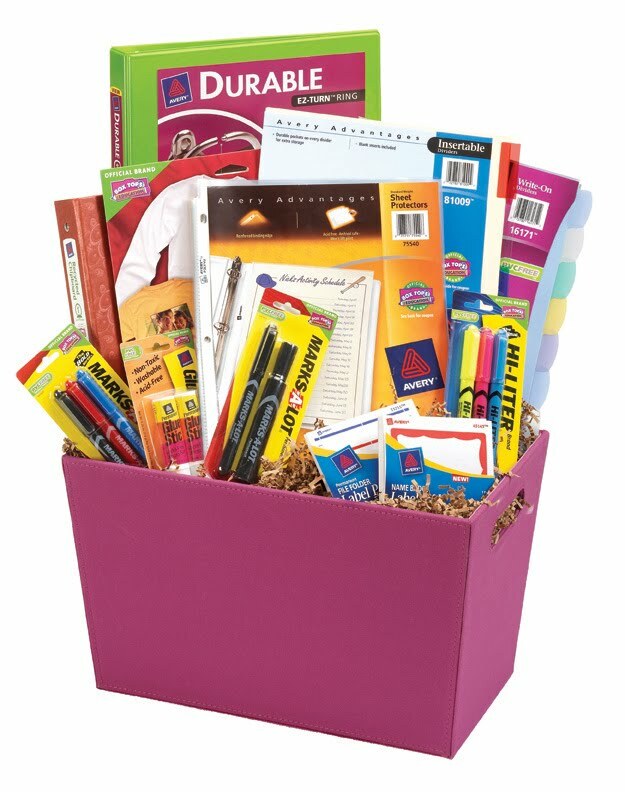 When you buy select Avery school supplies, you'll also receive Box Tops coupons that you can hand over to your school. Your school can redeem those Box Tops coupons for cash to purchase supplies, fund programs, etc.. To learn more, visit www.avery.com/btfe. Avery is hoping you can spread the word about the "Avery Celebrates Teachers", and has generously provided a great giveaway prize to generate some buzz! One lucky Bonggamom Finds reader will win a gift basket full of Avery Dennison school and office supplies such as Avery NoteTabs™, Label Pads, HI-LITERS®, Glue Stics, Labels, Binders, Dividers, Markers and more—a retail value of $50! Leave a comment on this post and tell me something you do (or would like to do) to make the job of the teacher in your life (your child's teacher, your friend, etc...) a little bit easier. This entry must be completed before extra entries qualify. 2) Grab my blog button and post it up on your blog (1 entry). This giveaway ends at 11:59PM PST on September 15, 2010; I will draw a winner at random on September 16 and post the winner's name after the winner confirms acceptance. For additional giveaway rules, click here. Good luck! Disclosure: Avery Dennison is providing the gift basket to the winner of this giveaway. I did not receive a sample or monetary compensation for this post. Sweepstakes information is provided by the featured company/product and is clearly indicated as such. The views and opinions expressed here are my own. This spring I had the pleasure of reviewing "E is for Ethics", a collection of twenty-six short stories about everyday situations faced by two children, Elliott and Lucy. Each story deals with a particular value such as Fairness, Honesty, Gratitude, Acceptance and so on. Author Ian James Corlett, makes each story simple and real, so any child can relate to the ethical dilemmas that Elliott and Lucy face. Alfie and I have found this book to be an invaluable tool in teaching our children about morals and opening up discussions about ethical situation and the "right" thing to do. So I was delighted when the publishers contacted me and offered to give a copy of this book away on my blog! One lucky Bonggamom Finds reader will win a copy of "E is for Ethics" by Ian James Corlett for their very own! Leave a comment on this post and tell me which value(s) you think is (are) most important to instill in your child. This entry must be completed before extra entries qualify. This giveaway ends at 11:59PM PST on September 20, 2010; I will draw a winner at random on September 21 and post the winner's name after the winner confirms acceptance. US addresses only. For additional giveaway rules, click here. Good luck! Welcome to Bonggamom's Friday Finds! I've been hosting this linky for almost a year now, and it has occurred to me that my standard, boilerplate text is getting old. As in, soooo 2009. So I'm going to try and liven it up a bit and actually say something different each week. Not that you're reading this particular post because of my great writing skills -- no, I'm content in the knowledge that you all come to Bonggamom's Friday Finds solely for the purpose of publicizing your giveaways and entering other people's giveaways. That's what it's there for. If you really want my wit and wisdom, go to Finding Bonggamom, right? But there's no reason your eyes should glaze over each and every time you come to the Friday Finds linky. Okay, your eyes are glazing over, aren't they? I'll shut up now. First-timers, ignore my blatherings and leave your giveaway links below. See you next week! My kids are nuts about Webkinz, so at first I was a bit disappointed to see Webkinz JR instead of Webkinz. Still, I thought, they're pretty cute, I might as well help myself. Well, guess which Webkinz 3Po sleeps with every night now? His new Webkinz JR. friend, a pink baby elephant that he named Cotton Candy! These animals are so adorable -- they're like bigger, softer, younger versions of Webkinz. 3Po and Jammy are absolutely fascinated by the way these little creatures vibrate and wiggle around their little track. They look like colorful rubber cockroaches to me, but they boys quickly leap to their defense "They're not cockroaches, mama! They're HEXBUGs!". 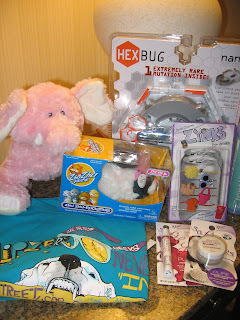 I've blogged at length about my kids' obsession with Zhu Zhu Pets, and I'm so glad that MomSelect is continuing their partnership with Zhu Zhu Pets! I was able to get The Pea a long-haired pink Zhu Zhu Pet named Roxie, and she loves it so much because she can comb Roxie's hair and style it all she wants. Just like all the other Zhu Zhus, it's brilliant! There were some great baby items which I didn't pick up, since I don't need them anymore, but I have fond memories of those SleepSacks and I recommend that every new mom buys one. And I was happy to see that one of my favorite companies, ActiveIon, is now working with MomSelect! Their Ionator home cleaner is an amazing product and we're loyal fans. Thanks, MomSelect, for hosting such a great event! Disclosure: At MomSelect's invitation, I helped myself to several samples from the Swag Suite, but was not paid or required to review any product or give my opinions. Product information is provided by the featured company/product and is clearly indicated as such. The views and opinions expressed here are my own. 1) Decide on a theme. Your shower can have any baby related theme -- rubber duckies, storks, bottles, pacifiers, or diapers -- or a color theme if the baby's gender is known, a children's character like Elmo or Winnie the Pooh. 2) Invitations are your first chance to make a great impression on your guests, so take some time to create invitations that match your party theme. Tiny Prints is one of my favorite places for baby shower invitations -- you can add photos and customize text on any of their gorgeous designs. 3) Coordinate presents with other guests so that duplicate items are minimized. For example, you could assign each guest a time of day in advance, and ask them to bring gifts the mom or baby could use at that time. You can let them choose either am or pm, or assign them an am or pm time. Examples: 8 PM could be pajamas, 10 pm could be bubble bath, 8 am could be an outfit, and so on. 4) Instead of a plain old guest book, have an advice book where guests can write down their favorite piece of parenting advice. 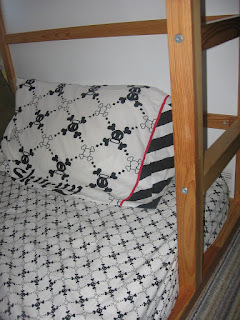 5) Hang a clothesline in the party room and ask guests to bring baby clothes as presents. Hang all the baby clothes on a clothesline -- the presents will do double duty as decor! 7) Party games are a great way for your guests to mingle and have fun. Scratch off games, personalized advice cards, and guessing the size of the mom-to-be's belly are fun activities. Reward your guests with thoughtful game prizes and funny loser awards. 8) Baby showers tend to be pastel-hued, girly affairs; for your unique shower, why not include the dad-to-be as well? Have a couples birthday party to "mourn" the end of the parents-to-be's Kid Free Years. 9) Find photos of the mom and dad to be when they were children, "morph" them using photo editing software, and present the parents-to-be with a photo of what their new baby might look like. 10) Send you party guests home with party favors personalized with the baby's due date. Disclosure: I wrote this blog post while participating in the TwitterMoms and Tiny Prints blogging program, making me eligible to get a Tiny Prints gift code worth $50, plus 25 FREE Tiny Prints greeting cards—a total gift value of $149.75! For more information on how you can participate, click here. The views and opinions expressed here are my own. As you know, this summer I was invited to help spread the word about McDonald's Family Time. Happy Time. campaign. In August I asked you all to spare some family time for the Ronald McDonald House Charities® (RMHC®) via their and so many families rose to the occasion. I'm no longer doing any "official" posts for the campaign, but I still think RMHC is a worthy cause to support and publicize -- so this September, I'm asking you to spare some change. We have a change jar in the kitchen; I often drop in pennies, nickels and dimes that I find lying around in our junk drawers, in the car, in my purse, and so on. I use it to pay the kids for chores they do that go above and beyond their normal chore routine. On September 9 I'll be taking it to our local McDonald's to empty it. It's time I started paying the kids in dollar bills anyway. Disclosure: I did not receive a sample or monetary compensation for this post. Information is provided by the featured company and is clearly indicated as such. The views and opinions expressed here are my own. Now that fall has arrived and the kids are off to school, my mind turns to thoughts of.... cards. Holiday cards, that is. I know it's early, but September will be here and gone before you know it, and I'm completely preoccupied with Halloween during the whole of October, so by the time November rolls around, it will be too late. So I need to start planning now -- scheduling the all-important holiday photo session, thinking of what I want to write for our holiday newsletter, and browsing around the internet for nice card designs. 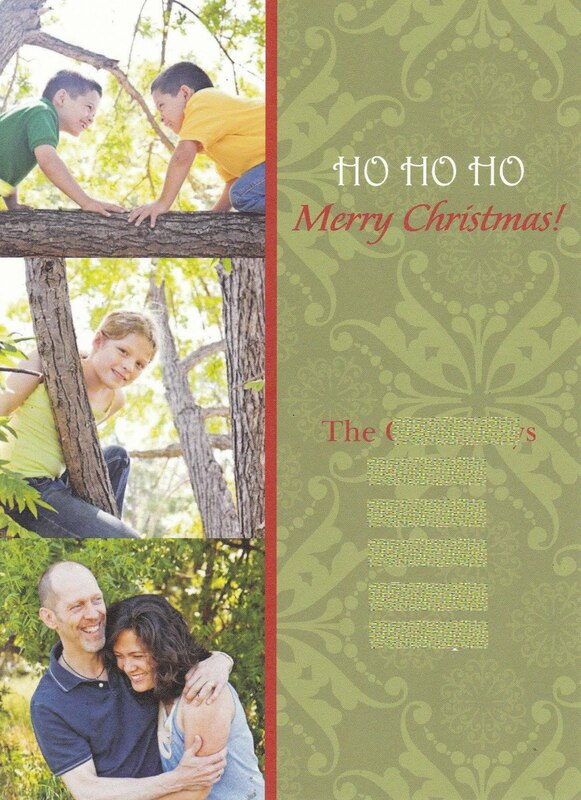 I was delighted to be invited by online card site CardsDirect.com to try my hand at designing my own personalized set of cards since they have a great selection of photo holiday cards. It just so happened that we had recently posed for photographer Anna Mayer, and the photos turned out so well that I decided to try them out for this review. Problem was, I couldn't decide on which photo to use. No problem: CardsDirect.com has tons of great photo cards featuring two, three, or more photos. I chose the Elegant Three Photos style because the moss-green background complimented the outdoor setting of the photos perfectly, and the color reminded me of the walls on our stairwell (it's one of my favorite paint colors ever). Designing the card couldn't have been easier. You can upload photos, enter text, select and change font style, size and color. You can also enter text on the reverse side (if the card is a flat card like this one) or on the inside of the card (if it's a foldover card). You can save your work and come back to it later, and nothing is set in stone until you preview each side of the card and give your approval. Prices are reasonable, ground shipping is only $5, and you can order as few as 10 cards. The whole process was quick and easy! The best reason, however, to order from CardsDirect.com is the card itself. Ours turned out gorgeous, and I can't wait to send them out. These cards are going to look great on my friends' and family's holiday mantelpieces! Check out the CardsDirect.com online store, then come back here and leave a comment with a link card design you love the most. This entry must be completed before extra entries qualify. This giveaway ends at 11:59PM PST on September 13, 2010; I will draw a winner at random on September 14 and post the winner's name after the winner confirms acceptance. Winner's code expires 12/30/2010. For additional giveaway rules, click here. Good luck! Disclosure: I received a complimentary order of cards to facilitate my review. Product information is provided by the featured company/product and is clearly indicated as such. The views and opinions expressed here are my own. I think autumn is one of the best times to visit the Disneyland Resort (okay, anytime is a great time to visit, but I'm talking really one of the best times). The rides and attractions are just as entertaining -- in fact they have special fall decorations and attractions -- but the crowds are thinner, the days are still sunny and the evenings bring on a chill that's actually a pleasant change from those hot, sultry summer nights. Best of all for budget-conscious families, it's the off-season, which means airfares and hotel rates are lower. Fall brings some great value packages at the Disneyland Resort, allowing you to experience Disneyland and Disney's California Adventure for less money. If that isn't Disney Magic, I don't know what is! As the spooky fun of Halloween Time at Disneyland Resort gets underway this fall, guests and vacationers can enjoy exciting savings with special resort vacation offers. Featuring such favorite seasonal attractions as Space Mountain Ghost Galaxy and Haunted Mansion Holiday, Halloween Time at Disneyland Resort offers families a chance to enjoy seasonal attractions and décor as well as interact with beloved Disney characters decked out in whimsical Halloween costumes. Guests will also encounter Cruella DeVille, Captain Hook and other Disney villains who make special appearances at Disneyland for Halloween Time. In addition, World of Color, the new nighttime spectacular in Disney California Adventure park, will perform nightly throughout the fall, presenting a dazzling array of characters, expressive music, performing fountains and astonishing special effects. Fall vacation value highlights at Disneyland Resort include a $300 savings on a four-day, four-night package at any Disneyland Resort Hotel if booked between now and December 1. For vacationers seeking a hotel room-only offer, great savings are available at all three of the on-site Disneyland Resort hotels, when booked between October 1 and December 1, 2010. For more information and to book, call your local travel agent or visit www.disneyland.com. Disclosure: I did not receive a sample or monetary compensation for this post. Information is provided by the featured company/product and is clearly indicated as such. The views and opinions expressed here are my own. The Pea, like most kids, has a natural curiosity about the world around her. And like most kids, she often comes to her parents with the dreaded "I'm boooooored". We recently tried out a unique kind of science kit that managed to feed that inquisitive mind and entertain her at the same time: A Secret Science Team kit. Keep reading to find out what we thought of it -- and to win one for your very own! Secret Science Team (SST) kits let kids solve mysteries by conducting science experiments. They are made by Ectropy Science and are appropriate for kids ages 9-12. They have been featured on Good Morning America and Toy Directory Monthly. They have also won Parents’ Choice Approved award for 2010. With Secret Science Team mystery solving science kits and other fine science-related toys and instruments from Ectropy Science, your child can experience what it is like to be a scientist. We take science to a higher level through a unique combination of mysteries, hands on science, and problem solving. * Ask a Question -- SST #1001 contains a newspaper clipping with information about a CD counterfeiting ring. A white, powdery substance (also included in the kit) has been collected from a crime scene and it is the kids' job to figure out what the substance is. * Do Background Research -- The kit contains various substances (i.e. powder, sugar, salt, etc..) that are similar in appearance to the unknown substance. * Construct a Hypothesis -- Kids compare the substances visually and make their own guesses as to what the unknown substance is (this isn't part of the instructions but The Pea did this spontaneously, and I would guess a lot of other kids would too). * Test Your Hypothesis by Doing an Experiment -- Kids perform a variety of experiments on each known substance, as well the unknown substance. Each SST kit contains all materials needed. * Analyze Your Data and Draw a Conclusion -- Kids chart the results of the experiment for each known substance, and compare results with the unknown substance. * Communicate Your Results -- Kids log on to SecretScienceTeam.com and enter their results; if correct, they get to read a news clipping announcing the arrest of the counterfeiters and how the Secret Science Team helped crack the case. This is a great science kit! I love how it captures kids' interest with the mystery/detective component, and I low how it helps kids practice analytical reasoning by following the Scientific Method. The instructions are clear and concise, and everything you need is included. In the end, I can think of no higher praise for this product than to say The Pea now wants to buy the other 2 Secret Science Kits... and she wants to have a Secret Science party for her 10th birthday so that all her friends can solve cases! Even better, she's now full of ideas on other experiments -- we're going to figure out which liquids (oil, vinegar, orange juice, Kool Aid) are acids, and look for things that are insoluble in water. Science fair, watch out! I have no complaints whatsoever about the SST kit we tried, but I'd love for the Ectropy Science online store to party kits so that 8 to 12 kids could participate in the same experiment (you can tell I'm already planning The Pea's birthday party). Of course, parents could buy the materials separately (and they do sell extra test tubes and droppers) but I'd love it all in one neat package. Update 8/24/2010: I've just been informed that Ectropy Science now sells birthday party kits! Ectropy Science's Secret Science Team kits are a fun, entertaining way to help your child learn basic science concepts and introduce him to scientific reasoning. One lucky Bonggamom Finds reader will win a Secret Science Team kit from Ectropy Science! Check out the Ectropy Science online store, then come back here and leave a comment with a link to the science kit you would most like to buy for your young scientist. This entry must be completed before extra entries qualify. 2) Leave a comment on any post on the Ectropy Science blog (1 entry, please leave the link to your comment). 3) Grab my blog button and post it up on your blog (1 entry). 7) Join any of the giveaways currently running on Bonggamom Finds (1 entry for each giveaway you've joined). This giveaway ends at 11:59PM PST on September 13, 2010; I will draw a winner at random on September 14 and post the winner's name after the winner confirms acceptance. For additional giveaway rules, click here. Good luck! As if we don't have enough Playmobil playsets already -- we own a Victorian Townhouse, a Knight's Castle and the Wildlife Care Station -- they keep coming up with new collections to tempt me into buying them! One of their latest, the School Playworld, is perfect for back-to-school imaginative play. If my kids were about to enter preschool or kindergarten I could totally use it as an excuse to get Playmobil's new Furnished School Building, because the playset would be a great way to prepare kids for unfamiliar situations by using the playset to act them out. Alas, my kids don't have any such back-to-school fears. I guess I'll just have to fall back on my old standby -- that you can never have too many Playmobil sets! PLAYMOBIL is introducing the School playworld, a brand new collection that will spark kids’ imaginations and prepare them for another exciting year of school. A leading toy manufacturer both in the U.S. and around the world, PLAYMOBIL is well known for its iconic toys that provide children with continuous hours of open-ended imaginative play. The School playworld, is no exception. As the collection’s feature set, the Furnished School Building set is equipped with everything a real school has – a variety of classrooms, PLAYMOBIL figures and accessories, a functioning bell and chalkboard – all of which will leave kids looking forward to school long after the final bell has rung. The Furnished School Building retails for $169.99 and the fun doesn’t stop there. Kids and parents can add more to their school with the School Gym, School Cafeteria, School Band and more. In recognition of it’s kid-friendly and educational, yet imaginative aspects, the PLAYMOBIL Furnished School Building recently won a National Parenting Center Toy Award – one of the most respected toy awards in the industry. Last year I blogged about Yo Gabba Gabba's first live US tour: Yo Gabba Gabba Live: There's a Party in my City!". Unfortunately for the kids, there wasn't a party in our city, but this time around the tour will be performing at San Francisco's Bill Graham Civic Auditorium in November! That's great news for parents with kids who love funny, colorful characters, catchy music, dancing, and lots of silliness -- in short, any kid. Check their list of tour cities to see if the party is coming to your city! Fresh off a triumphant sold-out tour debut, a headlining performance at The White House, a critically-acclaimed, chart-topping album, and an appearance at Coachella that garnered rave reviews from spectators and media alike, DJ Lance Rock and the cast of YO GABBA GABBA! are heading back on the road with YO GABBA GABBA! LIVE! : THERE’S A PARTY IN MY CITY! to play to enthusiastic fans on a 60-city tour across North America. Today’s hottest live show for families will make stops at top theaters, arenas and amphitheaters throughout North America, starting August 27 in Bethel, NY and ending in Dallas, TX on December 12. YO GABBA GABBA! LIVE! : THERE’S A PARTY IN MY CITY! is produced by S2BN Entertainment in association with Wildbrain Entertainment and The Magic Store. * The DVD “Yo Gabba Gabba! 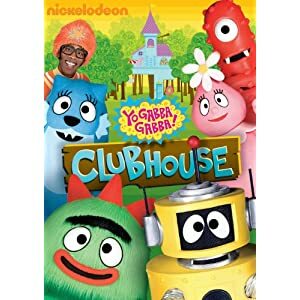 : Clubhouse” released on June 15, featuring performances by musical guests Erykah Badu, The Killers, Jimmy Eat World and more. 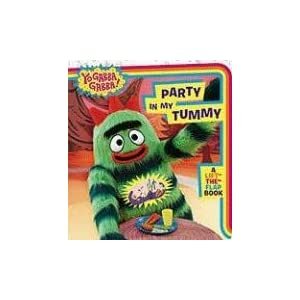 * A lift-the-flap board book, "Yo Gabba Gabba!, Party in My Tummy" - Based on the popular song from Yo Gabba Gabba!, Party in My Tummy makes healthy eating fun for little ones! Lift the flaps, sing along, and find out what everyone in Gabba Land is bringing to the party! * The cd “Yo Gabba Gabba! : Music is Awesome Volume 1” featuring songs from the Roots, The Shins and others. I reviewed Music is Awesome Volume 1 last year and thought it was awesome! (and speaking of awesome, “Yo Gabba Gabba! : Music is Awesome Volume 2,” featuring hit songs from seasons 1, 2 and 3 including super music friends Weezer, MGMT, Jimmy Eat World and songs from the show, will be available at Target on August 24th). Leave a comment on this post and tell me which city on the Yo Gabba Gabba! tour is nearest to where you live. This entry must be completed before extra entries qualify. This giveaway ends at 11:59PM PST on September 8, 2010; I will draw a winner at random on September 10 and post the winner's name after the winner confirms acceptance. For additional giveaway rules, click here. Good luck! Disclosure: I am receiving a similar prize pack as a thank-you for posting about the upcoming Yo Gabba Gabba tour. I was not paid to review the prize pack or the tour, or to give my opinions. Product information is provided by the featured company/product and is clearly indicated as such. The views and opinions expressed here are my own. The Pea absolutely loves sour gummy candies, and watermelon is her favorite flavor, so when I was invited to review Sour Jacks Watermelon candy, how could I refuse? Since first introduced in 1993, Sour Jacks have been one of America's favorite movie candies, and have grown to become one of the most loved candies in North America. Sour Jacks are a fat free treat, available in movie theaters and video store chains, grocery stores, vending machines, through fundraisers, in theme parks, and sports and amusement facilities of all kinds. It's sour, it's sweet and it's fun to eat! I like that it comes in little packs, so it's easy to control my kids' portion sizes. One pack shared between the three of them was just enough of a sweet (okay, sour) treat on a summer day. I could go on about the effect of too much sugar on my kids, but we already know that, don't we? The key word is treat, and as long as I make sure my kids get enough exercise and eat healthy meals and as long as I restrict the late-night candy intake, I don't feel guilty about letting have an occasional Sour Jacks Watermelon treat. Sour Jacks Watermelon candies are a mouth-puckering treat that's too sour to resist! Disney’s Beauty and the Beast I remember watching Disney's Beauty and the Beast on Broadway over a decade ago, and even as an adult I found my eyes, ears and heart couldn't get enough of it. I loved the costumes, scenery, music, special effects, all of it. It was amazing to think that a children's fairytale could be so touching and appealing to an audience of all ages! When the show closed, I felt sad because I had kids by then, and there go my chances of taking my kids to see Beauty and the Beast. I'm so happy (for my sake and for all the other families out there) to find out that Beauty and the Beast is back on stage, and this time it's going on tour -- which means that it might be showing in a city near you!! The show is going on a yearlong journey across the US, starting with San Francisco on August 17-29; it then moves on to San Antonio, TX, San Diego, CA, and more (49 in total!) before ending in June 2011. You can find the full tour schedule on the Beauty and The Beast On Tour website. Last night I was invited to the opening show of Beauty and the Beast at the Golden Gate Theater, and I took The Pea, who was extremely excited at the thought of being in the very first audience for the new touring show. She was worried that the show would be too babyish (it's been ages since she saw the Disney movie, and to her Belle is just another Disney Princess), but she ended up laughing, gasping and crying harder than anyone else in the audience. And even though I've seen the Broadway show (as well as a million and a half showings of the Disney movie), I thought this production was wonderful. The stage seemed smaller, and the cast fewer, than the original show -- but I suppose that's because it's a touring show and they needed to simplify it a bit. Not that there's any shortage of special effects -- I thought their giant wolf puppets were quite ingenious, and their "Be Our Guest" number was glitzy as a Paris revue, with sequins and sparklers and trumpets that shoot out streamers (The Pea and all the little girls in the audience went scrambling for them!). They did a great job of recreating Belle's cartoon world, and I'm sure many children and their parents will be able to mouth the dialogue word for word. That's not to say that the show is a carbon copy of the movie. There are added scenes and songs, and in fact, the producers have revamped every aspect of the original stage show, from sets to costumes to dialogue to musical numbers (I love, love, love the new mug-clinking dance sequence in "Gaston"!) , so that even after all these years, the show is as fresh as, well, a rose petal. But it's still the story that little princesses everywhere will be spellbound by (including my own 9-year old princess), and the story tugs at my heartstrings just the way it always does. It is, after all, a Tale as Old as Time. Disclosure: I received complimentary tickets to the show, but was not paid to review the show or give my opinions. Product information is provided by the featured company/product and is clearly indicated as such. The views and opinions expressed here are my own. Hey, iPhone owners! My loss is your gain -- I was recently invited to review the new Carnival Games® for the iPhone® and iPod touch®, but Boo Hoo, I don't own an iPhone or iPod Touch! But I was allowed to keep the game code, so I'm giving it away here to one lucky Bonggamom Finds reader. Carnival Games® made it to the Top10 grossing iPhone apps (i.e. games & software) on the U.S. Appstore. Moreover, the Lite version is currently the #4 most downloaded free game on the U.S. Appstore. Carnival Games allows you to fully customize your character – from hair color to wardrobe – and play over 10 games of chance and skill that are sure to thrill, including Clown Bonk, Bumper Boats, Star Shootout, Test of Strength, Spilled Milk, The Great Swami, Shooting Gallery, Frog Leap, Balloon Darts, Wild West Showdown, and Nerves of Steel. Explore the fairgrounds to discover surprises while doing your best to win amazing prizes –including wacky wearables like a pirate hat, dragon snout, gorilla toes, butterfly wings and even a ninja sword. Everyone’s a winner with Carnival Games®. You can almost smell the cotton candy! Leave a comment on this post and tell me your favorite carnival game. This entry must be completed before extra entries qualify. This giveaway ends at 11:59PM PST on August 27, 2010; I will draw a winner at random on August 28 and post the winner's name after the winner confirms acceptance. The prize consists of a code good for 1 free download of Carnival Games. The code expires on September 16, 2010. For additional giveaway rules, click here. Good luck! Classic Disney characters such as Mickey Mouse, Minnie Mouse, Winnie the Pooh, and a host of beloved Disney characters get a brand new stylized look in the Pook-a-Looz line created by Disney Consumer Products. The trendy designs will appeal to avid tween collectors, but Pook-a-Looz is still cute enough for kids of all ages! JAKKS’ CDI division launches novelty products based on the stylized look of Pook-a-Looz, including Pook-a-Looz Wobblers, Yip Yappers, Spinners and Walkers – perfect for collecting, displaying and trading! For back-to-school, Pook-a-looz Yappers are on a keychain and feature characters that all school-age kids know and love, from Mickey and Minnie to Buzz Lightyear. They are perfect for collecting and clipping onto your locker, backpacks, wherever! Bring them in for show-and-tell or trade with your friends. Ages 5+, SRP $4.99 Currently available at Walmart and Toys”R”Us stores nationwide, and next month at Target. Everyone's favorite by far was the Tigger Yip Yapper, which makes an adorable yapping sound when you open its mouth. Jammy is dying to get the Toy Story Green Alien version! By the way, if you're worried about the sound getting too irritating (and honestly, I think it's so cute that it hasn't happened to me yet; in fact, I find myself yapping now and then), don't worry: it's also a keychain so your kid can attach it to his backpack and take it away from home, where it can't possibly annoy you. Here's our fun Minnie Spinner; pull one of her arms to get her spinning like a top. She has already inspired several competitions between 3Po and Jammy to see who can spin her and keep her upright the longest. We also received a Pooh Wobbler, and a Mickey walker (a wind-up toy with feet that march up and down), which look every bit as cute as the others. I wish all the Pook-A-Looz were keychains, so that my kids could take them around and show them to their friends without worrying about them getting lost. Pook-a-Looks are a cute novelty and a small, fun back-to-school present for the kids. Disclosure: I received product samples, but was not paid to review the product or give my opinions. Product information is provided by the featured company/product and is clearly indicated as such. The views and opinions expressed here are my own. 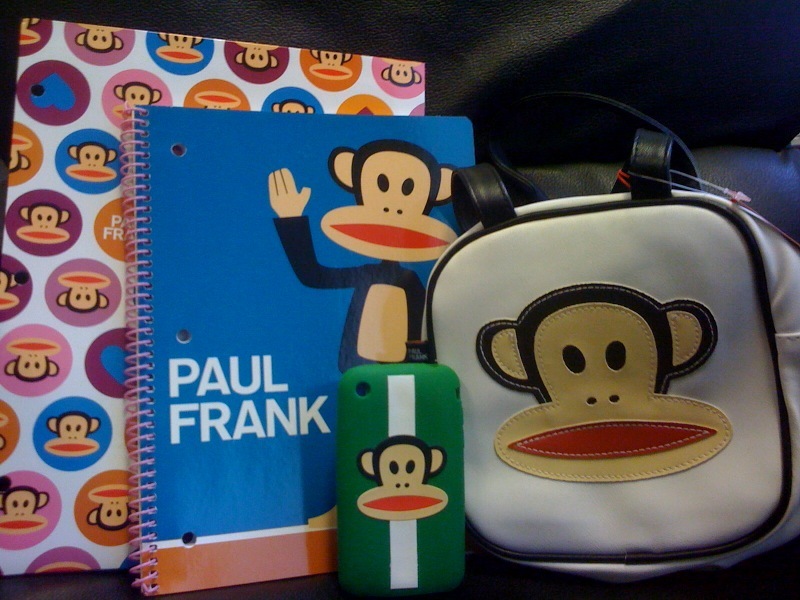 They've also got Paul Frank clothing, including the cutest Julius and Skurvy underpants from Target! There's just something about that bright, bold Julius monkey (and his Skurvy skeletal friend) that appeals to kids. This helicopter-print case for the Macbook Pro is so bright and sunny, just looking at it makes me smile. You can purchase this Julius notebook online or at Office Depot; it's an inexpensive way for a kid to make a fashion statement! 3Po and Jammy would tear their skulls out for a Skurvy boys' hoodie like this one. 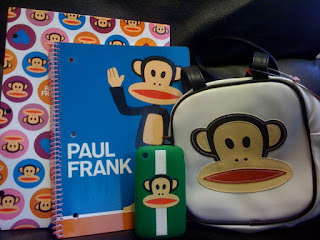 You can find these products and more at Paul Frank retail shops and PaulFrank.com. 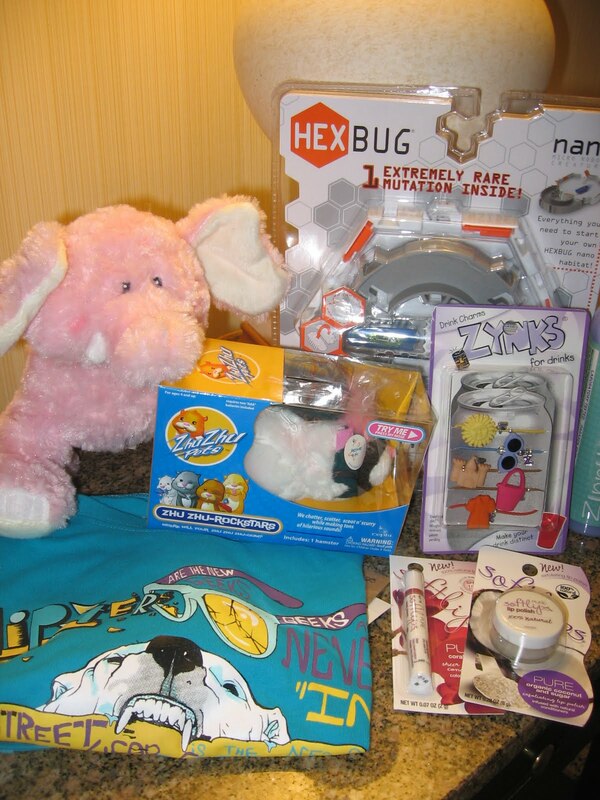 (note: contents of prize pack may be slightly different from the items pictured above). Leave a comment on this post and tell me what you are doing to prepare your child for the upcoming schoolyear. This entry must be completed before extra entries qualify. This giveaway ends at 11:59PM PST on September 8, 2010; I will draw a winner at random on September 9 and post the winner's name after the winner confirms acceptance. US addresses only. For additional giveaway rules, click here. Good luck!